What Impact Might SpaceX's Falcon Heavy Program Have on the Atmosphere? A Falcon Heavy rocket takes off from NASA's Kennedy Space Center on Feb. 6, 2018. 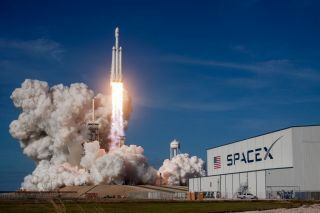 The first SpaceX Falcon Heavy rocket soared towards Mars orbit last week. The cargo-lifting rocket was on a test flight that met most of its major objectives. The star of the show was a cherry red Tesla Roadster that the rocket hefted into space, complete with a space-suited mannequin in the driver's seat. SpaceX founder Elon Musk is also the founder of Tesla, and he thought a car would be more interesting than some sort of simulated spacecraft. In the wake of the successful test launch, space pundits mused on what the successful Falcon Heavy launch would mean for founder Elon Musk's eventual plans to build a Mars colony. Musk once said he hoped to transport a million colonists to Mars. They won't be riding Falcon Heavy rockets — it will be long discontinued by then. The Falcon Heavy will be replaced by a bigger version called the Big Falcon Rocket — or Big F***ing Rocket. But what impact might these rockets have on Earth’s atmosphere, especially in an era of rapidly accelerating climate change and continued concerns about the ozone layer? The Falcon Heavy produces emissions from its oxygen and kerosene fuel inside of its boosters, said Darin Toohey, an atmospheric scientist at the University of Colorado, Boulder. Toohey researches how aerosols and trace gases affect Earth's climate — including after a rocket launch. Back in 2009, Toohey co-authored a study in the journal Astropolitics noting that rockets damage Earth's ozone layer — a natural shield in the stratosphere against the sun's ultraviolet radiation. In an interview with Seeker, he noted that the effects are more pronounced when rockets are launched in bulk. One at a time is not as much of an issue. "If you were there [in the stratosphere] and waiting around you might notice it's different" after a single launch, he said. "But it mixes after a while, and the plume disperses and it does downwind." The effects vary depending on what kind of fuel is used in a rocket. One of the greatest concerns to scientists are rockets that use chlorine, such as the space shuttle's solid rocket boosters. "Those destroy ozone. It's just gone," Toohey said. The Falcon Heavy's kerosene boosters would also contribute to ozone depletion due to their outputs of nitric oxide and nitrogen dioxide, both of which react with ozone in the atmosphere. Falcon Heavy can lift about 68 metric tons of equipment, more than double the 29 tons that its closest match – the Delta IV heavy – can launch. The oxygen fumes from Falcon Heavy have some lasting effects. Cameras on board the rocket showed condensation in the troposphere (lower atmosphere) forming due to the plume. This was a side effect of the extra water from the rocket's fuel, humidifying the upper atmosphere. These are called noctilucent clouds and have been seen behind rockets and airplanes, Toohey said. What's more worrisome is what may happen when the rocket goes up further in the atmosphere, where oxygen is not as abundant. There, a rocket’s exhaust can form black carbon. "We're pretty confident that what these black carbon particles do is change the local radiation," Toohey said, meaning that the particles' dark color black carbon absorbs heat and in turn warms the atmosphere around it. Public sources say the three Falcon 9 rockets that make up Falcon Heavy have about 440 metric tons of kerosene between them. The gas has a 34 percent carbon content, which means the rocket generates roughly 149 metric tons of carbon per launch. Carbon dioxide emissions from fossil fuels is the leading contributor to climate change. The amount from a single launch may not be a big deal, but might become one if SpaceX pursues an aggressive schedule. For this reason, Toohey urges that Musk spread out his plans to send a million people to Mars. "My first impression would be to do it slowly, not in the same year." Toohey added, however, that it's hard to get reliable data on how much rockets affect the atmosphere because companies keep rocket data confidential. While Musk is aware of the University of Colorado's work — he spoke there in the past, Toohey said — the department doesn't have much information about his rockets' performance in the high atmosphere. He urged all rocket companies to become more transparent. Supersonic aircraft, which also fly in the high atmosphere, have been studied extensively and also show effects on ozone, according to the Intergovernmental Panel on Climate Change. Toohey said it's silly to do so many studies on the environmental impacts of aircraft and to forget about studying rockets.